Elvis Lives might sound like a headline from a National Enquirer or Sunday Sport front page but it is in fact a video slot from WMS. Played using a 5 reel, 12 row, 50 payline game engine, it comes with a rocking soundtrack and plenty of extras including free spins and pick me rounds. Play on your PC, tablet or mobile from between 50p and £100 per spin. With a crooning Elvis watching over, you’ll see K, Q and J royal symbols spinning around the reels as well as sunglasses, microphones, flowers, belt buckles and an Elvis In Concert logo. You’ll also see 3 different Elvis symbols, each one taking in a different part of his career. These 3 symbols all pay double your total stake if you land 5 on a payline. The trio of Elvis symbols all spin in stacked formation too. There’s also a wild. Aloha Free Spins feature – 7 free spins are on offer if you trigger this round. These come with wandering wilds which dart around the reels and wandering doubles that provide a 2x multiplier boost when they make part of a winning line. TCB Free Spins feature – land this feature and you’ll get 5 free spins complete with special green, pink and blue ring symbols which are all wild. Bet multipliers are on offer if you land a 3-of-a-kind win with any ring symbol You can add more free spins to your tally here too. Jumpsuit Picker Bonus feature – Elvis appears sporting an outlandish, gem-encrusted cape. Pick from the stones to win cash prizes. There are 3 levels to work through here. If you successfully clear the final level, you could pocket a jackpot prize of 500 times your bet. 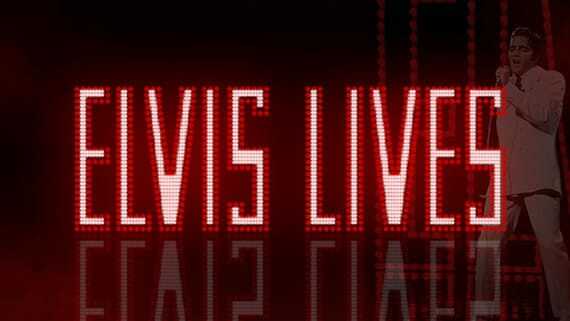 Elvis Lives Bonus feature – lighting up the Elvis Lives sign is the name of the game here. The more lights that are illuminated, the bigger the prize. Light them all and you’ll have a shot at landing the jackpot prize of 2,000 times your bet. The design in Elvis Lives is pretty good. The visuals are nicely done and there’s a bouncy, rock ‘n’ roll soundtrack playing as you spin. You’ll hear Elvis crooning away during the features too. Those features aren’t the easiest to come by, but they can deliver some decent action when they do. Fans of ‘The King’ should find plenty to enjoy here. Even if Elvis isn’t one of your musical heroes, then there’s enough going to make Elvis Lives worth a spin. If you like video slots based on music, Guns N’ Roses by NetEnt should get you rocking.